Canada: Who Do We Think We Are? is a new exhibition by Library and Archives Canada (LAC) marking the 150th anniversary of Canadian Confederation. This exhibition is accompanied by a year-long blog series. Join us every month during 2017 as experts, from LAC, across Canada and even farther afield, provide additional insights on items from the exhibition. Each “guest curator” discusses one item, then adds another to the exhibition—virtually. Be sure to visit Canada: Who Do We Think We Are? at 395 Wellington Street in Ottawa between June 5, 2017, and March 1, 2018. Admission is free. Canada is no longer known as a “Dominion” of Great Britain. According to legend, Father of Confederation Samuel L. Tilley borrowed the word from a biblical psalm. It would become part of our nation’s first formal identity. I became interested in history—more specifically, the history of technology and of industry—while growing up in Brantford, Ontario, an old factory town not too far from Hamilton. If Hamilton was known for making steel, Brantford was known for making farming equipment. By the time I lived there, all the big Canadian farming companies had left, leaving nothing but the old factory buildings and the memories of the older generation. Exploring that history left me deeply interested in the machines that Canadians invented, made and used—and the places where they did all three. It was the start of my journey into history. I no longer live in Brantford, but everywhere I go I find myself searching for signs of Canada’s industrial past. Is there anything else about this item that you feel Canadians should know? The first practical photographic process was invented in 1839 by Louis-Jacques-Mandé Daguerre, which is why this type of photograph is called a daguerreotype. Although the photograph is normal to us, the daguerreotype process is not, and probably requires a bit of explanation. The daguerreotype used a silvered copper plate as “film.” The surface of the plate was chemically treated so that it would be sensitive to light. This light-sensitive plate was placed in a dark box—the camera—until it was exposed to the scene it was meant to capture. After another chemical treatment, the image of what the plate had been exposed to was plain to see, in a very crisp black and white. 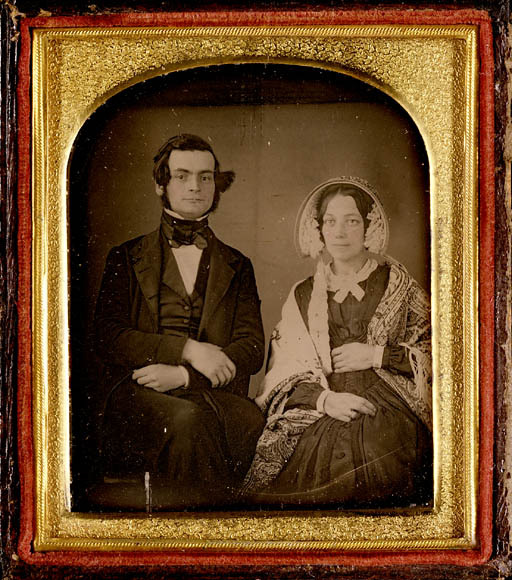 Daguerreotype images seem to float above their plates, giving them the illusion of depth, a unique property that no other form of photography has managed to duplicate. Daguerreotype exposures are not instantaneous. One would have to hold still for up to two minutes, or the resulting image would be blurry. This is the reason why most early photographs are formal portraits of sitting individuals or other static scenes. The expense and time required also meant that taking a photograph was an event worth dressing up for. Have you ever had to keep smiling as someone fumbles with their camera? Holding a smile for more than a few seconds can be painful. Now imagine trying to hold a smile for two whole minutes. Early photographs like this one show our ancestors to be grim, but a frown is much easier to hold than a smile! When we look at historical photographs, we must think about not just the subject matter, but the technology used to capture the image. The Tilleys, pictured here in stiff and formal poses, were not necessarily stiff and formal people. We would never know it from these daguerreotypes, as the limitations of that technology meant only some sorts of scenes could be captured. When historians look at historic photographs, we have to think about what we have seen—and what we have not. There is an item in LAC’s collection that complements this daguerreotype quite well. It is another photograph, one that shows a scene quite different from the genteel setting that the Tilleys were photographed in. More than a century after the daguerreotype of Samuel Tilley was taken, Canada was in the midst of one of its periodic booms in immigration. Photography was now more than developed enough to do what the old daguerreotype could not—candid snapshots. More importantly, photographers were now interested in taking pictures of regular people, like those of new immigrants, and later of refugees. Both are represented in this exhibit. 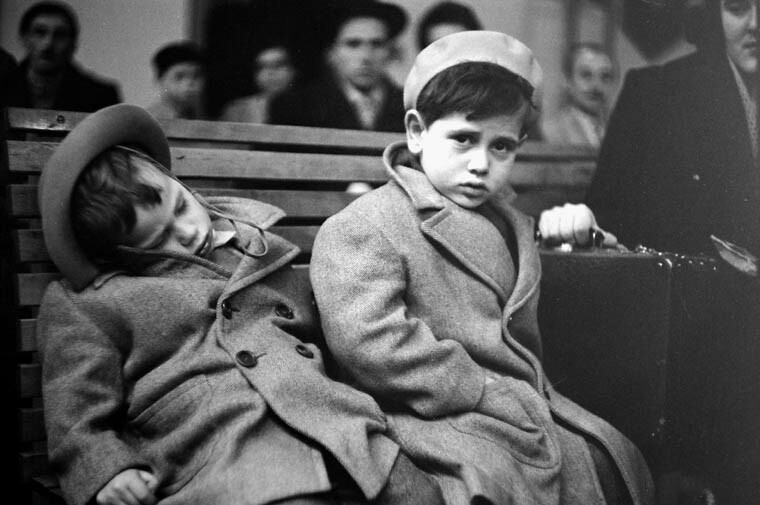 This snapshot is of a pair of young immigrants, waiting to be processed through Pier 21 in Halifax. The year is 1952, and these two tired-eyed children have just disembarked from the S. S. Argentina. Their faces show exhaustion, trepidation and perhaps some annoyance at the wait. Which of these photographs show a better image of Canada? I would suggest that the versions of Canada that these photographs depict are equally valid. Both photographs show stories that are worth telling. This photograph does not show a Founding Father of Canada. The names of these two children are not recorded. But they are Canadians, all the same. Their experience of Canada was quite different from the experience of Samuel Tilley, but both were important to the growth of our nation. Photography has become a great social leveller. It is no longer the preserve of the well-off. We are indebted to those early daguerreotypists for capturing the faces of early Canadians, but they could not capture how they looked outside of the studio. More modern photographers have given us windows into what Canadians really look like. Scott Dickinson is a young museum professional with a great interest in the history of the technology that Canadians use every day. He holds an Honours Specialization in History from the University of Western Ontario (2014) and a Master’s Degree in Public History, also from the University of Western Ontario (2015). 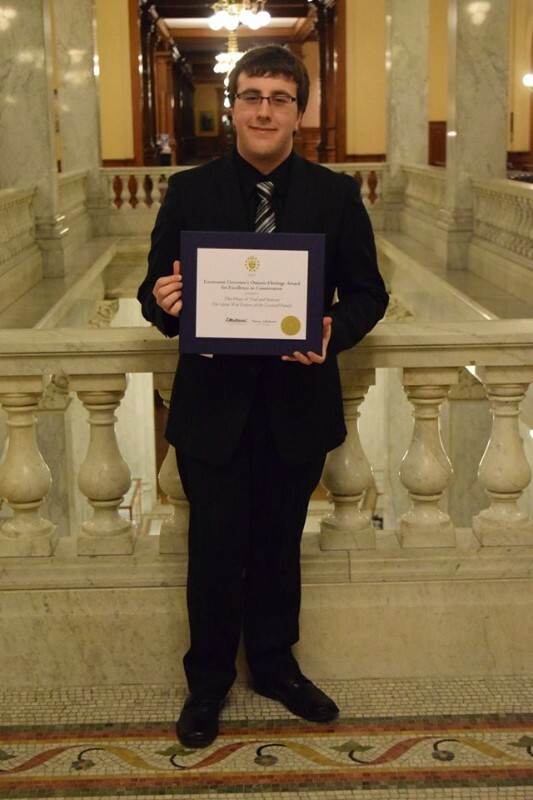 He is currently a student in the Museum Management and Curatorship program at Fleming College. This entry was posted in Exhibitions and tagged Canada150, Exhibitions, Immigration, Photography by Library and Archives Canada Blog. Bookmark the permalink.